A Rubus idaeus L. subsp. vulgatus cultivar. ‘Fruit large, roundish, inclining to conical, of a deep crimson colour, very fleshy, and with a fine brisk flavour and fine bouquet. There are several forms of this variety differing more or less from each other both in the fruit and the canes. The true old Red Antwerp produces vigorous canes, which are almost smooth.’ [Hogg – Fruit Manual p.265/1860]. ‘This variety has now been long established in our Gardens: it was the first improvement in size on the common native red Raspberry of our woods, and it maintains its station with the market gardeners, because it is an abundant bearer, ripens early, and bears carriage well. In situations where the plants grow with much vigour, a crop is sometimes produced in the autumn on the shoots of the year; this is, however, at all times but a scanty one, and too small to entitle the kind to the name of a double-bearing variety. Canes strong and long, yellowish green, slightly glaucous, occasionally tinged with purple, covered below with dark-brown bristles, which decrease in quantity upwards: early in the autumn the canes change colour, and become entirely brown sooner than those of most others. Bearing Wood vigorous, and nearly smooth.’ [PM t.24/1838]. Probably obtained from George Stevenson, South Australia, in 1844 [MP A2933-1, p.21/1844]. 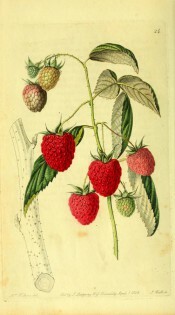 Subsequently listed in the 1857 catalogue as ‘Antwerp’ [Raspberry no.3/1850].